A $50.00 deposit is required to start a standard commission piece. All Deposits are non-refundable. Pricing does not include shipping and handling fees. Payments are made by personal check or money order. (Credit card service will be added: TBA) All checks are made payable to Marie R. Stonestreet. A receipt of payment will be issued once the funds have cleared. Work will not commence until initial deposit has cleared. All commission pricing on works are subject to 7% Indiana sales tax, not included in the base price. Shipping is a separate charge unless you live in the Indianapolis Metropolitan area and the piece can be hand delivered. Shipping will be calculated based on size and zip code at the beginning of contract. 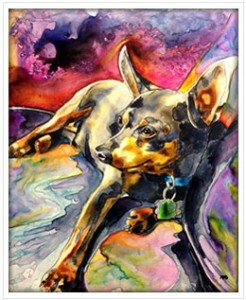 All prices listed include a custom animal, pet portrait, portrait, floral or botanical still life. All works are limited to one subject matter. For works 18X24 and larger, add 30% to the list price for each additional subject. 1) $50.00 Non-Refundable deposit due at Initial Consultation and signing of commission contract. 2) 30% of the total balance due at sketch and composition client approval stage. 3) Final balance due at Finalization and Approval stage of the custom artwork. Artwork will not be shipped nor change hands until payment has cleared the bank. All artworks are copy written under Marie R. Stonestreet. To purchase reproduction rights of the pieces, there is a $250.00 one time fee and consent of copyright signed by client and artist. Once this process is complete and payment is received, a Hi-Resolution quality image will be sent to client 300 dpi for reproduction purposes.